How do I Delete or Restore a Video from Office 365 Video? Select the channel from which you want to delete a video. Select the thumbnail of the video that you want to delete. The video player page appears. On the top navigation bar, choose Delete. In the Delete Video dialog box, choose Delete to confirm that you want to delete the video. Note: When you delete a video from an Office 365 Video channel, it is moved to the SharePoint recycle bin where it will be permanently deleted after 30 days. After you delete a video, it can take a while for search indexing to complete, and then the video will no longer be visible in Office 365 Video. Select the channel from which the video was deleted. 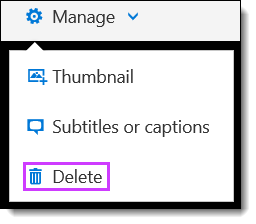 On the Office 365 Video top navigation bar, choose Recycle Bin. In the Recycle Bin pane, select the video you want to restore or permanently delete. Click Restore Selection to restore the video to its original channel or click Delete Selection to permanently delete the video. Click OK to verify the restore or delete or click Cancel to go back to the list of items in the Recycle Bin. Want more information? Why not head to the complete article at Microsoft's Original Webpage?